Day two of the Writers’ Retreat at Interlochen and participants are bent over their work with a seriousness of purpose and play. So far we’ve had workshops and readings and craft talks; considered questions of truth and fact and first, second, and third person points of view; drawn and wrote and read back and commented and all been part of a writers’ (writing) community. Today the hike and write in Sleeping Bear Dunes National Lakeshore had to be canceled due to the promise of inclement weather, but after some first grumblings of disappointment, I think we all welcome the time to go back to our rooms or cabins or the nooks and crannies of The Writing House to write, rest, read, and respond to all that has come our way. Tonight, June 21, 2011 readings by poet and memoir writer Fleda Brown and fiction writer Tony Ardizzone. 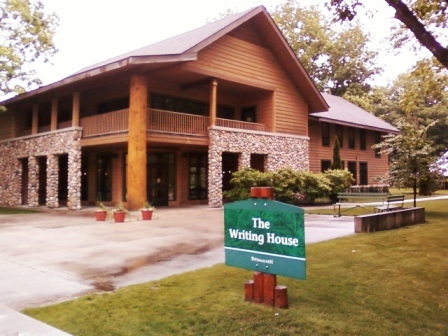 Starts at 7:30 in The Writing House at Interlochen. Elvis Costello will be here, too. (Okay, not really here as in the Writing House, but in concert in Kresge Auditorium at Interlochen Center for the Arts.) Come on by. Patricia and Philip Hartigan are truly providing inspiration to our creative muse! It’s a rare opportunity to work with the written word and our own drawings and images! The craft talks offer additional ideas and tools to help us along the way! The only thing that is not the best is the weather, but we cannot do much about that. In some ways it’s nice not to have the temptation of sunny skies to lure us away from the task at hand! Jo Anne, thanks so much for being part of this week. It is so good to get to know you, see your sketches and hear your writing. I look forward to your contribution to View From the Keyboard! And thanks, too, for being a subscriber. Oh man that place looks so cool! Keep the posts coming. Each time I read one I get more determined to finally make it to the Interlochen Writers’ Retreat next summer. Did you see Elvis? Jana, this place is made for you. I hope you can get up here sometime soon. And no, we didn’t see Elvis, but we could hear him across the lake. Viki J saw him from her hotel window, though, and heard every bit of it. See you back in Chicago soon! 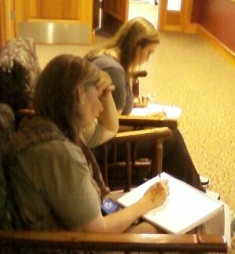 Patty and Philip, I drove the ten miles home, worn out, but also refreshed with energy for writing and drawing. You have opened a new world for me. Napping, then stepping out to walk through Timber Trail, I noticed every blade of grass, 150 year old tree, and small flower. They were standing at attention…ready to be drawn. I’ll return there later to sketch. Thanks for the inspiration, humor, kindness, and support you gave us all this week. You’re a class act! Joan, it was so good to share our time with you up there. What a delight to see the work you did in such a short time. Your piece was recalled over dinner that night, particularly the part about slicing into the water, and the moonlight on the minnows. Keep it up, woman! And let us know how things go with your students as well.